There are numerous elevation datasets with global or nearly global coverage, but by far the most significant is SRTM. A free dataset created by combining data from many sources, including gap-filling SRTM, and sheets of contour maps. Coverage at 3 arc seconds is now global, and unlike SRTM and ASTER GDEM, there are no serious voids or artifacts. "..unfortunately not quite all the world was mapped. [..] Although the 0.2% of the rest of the world may not seem significant, its significance is increased by the fact that it covers the highest summits of most of the world's mountain ranges, including all 14 of the world's 8000m+ summits and most of the world's 6000m+ summits. [..] More than 10 years later, NASA's SRTM data still do not cover these areas. 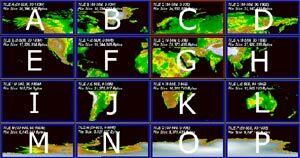 I began the task of filling them from alternative sources in May 2005 and completed it in November 2012, completing NASA's mission to map the world." There is even data for e.g. Norway, Sweden and the Faroe Islands where no SRTM data is available. Not available yet, but... a project of the European company Astrium, begun in 2010, with data promised in 2014, which is "intended to be the replacement dataset for SRTM"
Global homogeneity, highly consistent dataset thanks to data collection within 2.5 years only. No ground control information needed thanks to high geometric precision of sensors. No word yet on whether it will be as free and unrestricted as SRTM. "Global Multi-resolution Terrain Elevation Data, 2010". Produced by the USGS in 2011 by combining the "current best available global elevation data" from public sources. It is multi-resolution, with areas at 30-, 15-, and 7.5-arc-second resolution. In theory, it replaces the older GTOPO30 dataset (see below). 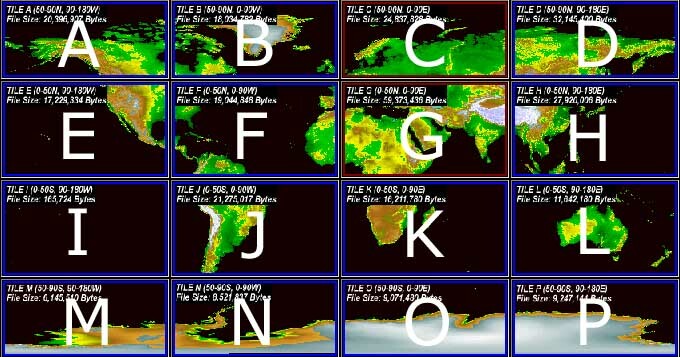 The dataset is delivered as tiles whose dimensions are 30° of longitude x 20° of latitude. GDEM is 30m elevation dataset created by stereo-correlating the 1.3 million scene ASTER VNIR archive, covering the Earth’s land surface between 83N and 83S latitudes, formatted in 1 x 1 degree tiles as GeoTIFF files. NASA’s GDEM WIST site. However, the process is cumbersome, involving registration and a complex search. In fact, as of July 2009, when i attempted to find GDEM for two areas (Hawaii and Bolivia), both searches came back with the name of the data file (e.g. ASTGTM_S20W065.zip) but "On-line Access: Access Unavailable"
Japan's ASTER GDEM site, which is easier to use. In a review at the time of release, it was observed that "While the elevation postings are ~30 m, the detail of topographic expression resolvable in the ASTER GDEM appears to be between 100 m and 120 m... residual cloud anomalies, a variety of pervasive artifacts.. straight lines, pits, bumps, mole runs, and other geometric shapes.. unsightly bump/pit pairs." Same resolution as DTED0, GLOBE and SRTM30 - but older and less accurate. A collection of 33 files. The file extension is "DEM" but it's not the same format as normal USGS DEM. USGS HYDRO 1K Elevation Derivative Database is a version of GTOPO30 which has been corrected using hydrology data. Claims "Seamless, void-free coverage across the entire globe, 30-meter ground sampling. Aggregates ASTER, SRTM and GTOPO using worldwide control combined with Intermap’s proprietary data fusion technology." Commercial: "pricing is as low as $0.01 per square kilometer"